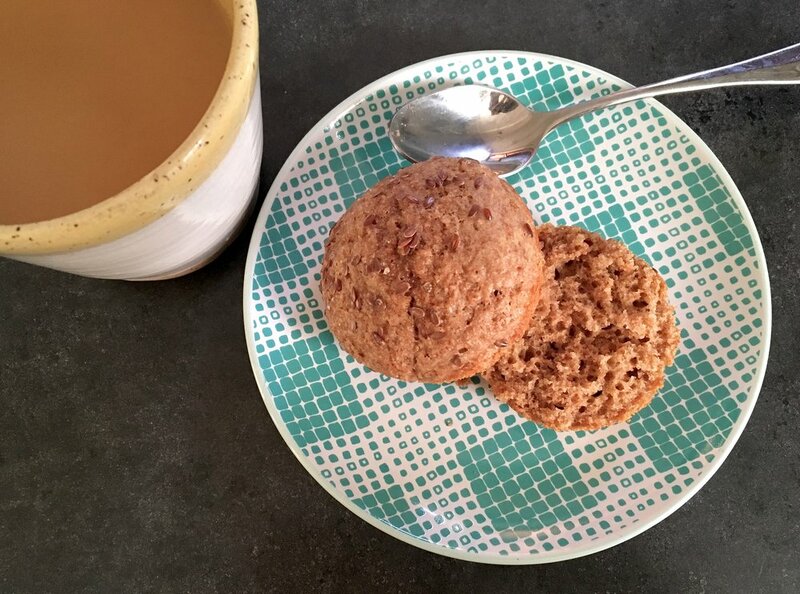 Back to basics this morning with a simple yet delicious bran muffin. Nothing fancy, nothing weird. Start with some wheat bran (obviously) and whole wheat flour for healthy whole grains. Add in some Greek yogurt and butter, a little sugar and an egg and you're basically there. I love experimenting with new grains so I used spelt flour for these muffins but regular old whole wheat would also work. If you have some raisins hanging around go ahead and add those in for a nice raisin bran muffin. I didn't have any in the pantry so I skipped it this time and they were still wonderfully delicious and flavorful. These muffins bake up tall and beautiful, just how I like my muffins! They are very light and tender, I couldn't at all tell that they were 100% whole wheat. The flax and coarse sugar on top is just the finishing touch to really make these humble muffins shine. Adjust oven rack to middle position and preheat to 350°F (177°C). In a large measuring cup, combine wheat bran and boiling water. Let stand 5 minutes, then stir in Greek yogurt and egg. Meanwhile, combine whole wheat flour, all-purpose flour, sugar, cinnamon, baking powder, salt, baking soda, and butter in the bowl of a stand mixer fitted with a paddle attachment. Mix on low speed until the butter is incorporated, then add bran mixture and continue only until the batter is well combined. With a flexible spatula, scrape the bowl and fold the batter once or twice to make sure it's well mixed from the bottom up, then fold in the raisins if using. Divide the batter between 8 lightly greased muffin cups. This is enough to completely fill each cup with a little mountain of batter, but do not be alarmed; it will rise significantly but spread very little overall. If you like, sprinkle with flaxseed and turbinado sugar, and bake until puffed and firm, about 16-18 minutes.